Do I have a roaming profile? 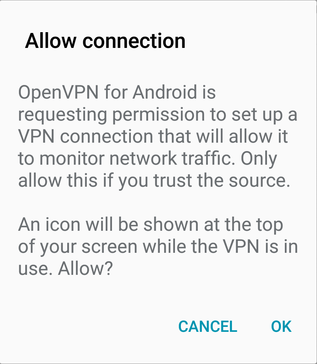 Download and install the "OpenVPN for Android" app (Arne Schwabe) from the Play Store. Start up open VPN and click the Import button. 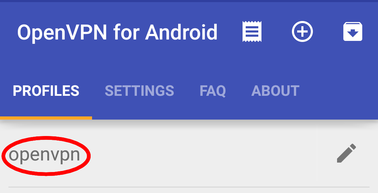 If you are running android 5 you may need to select "Import Profile from SD card". Browse to the location you downloaded the Configuration File to. Go back to the Profiles screen and click on the openvpn profile. Click OK to allow the connection. Enter your CRSID followed by '@ch.cam.ac.uk' in the Username field (e.g spqr2@ch.cam.ac.uk). 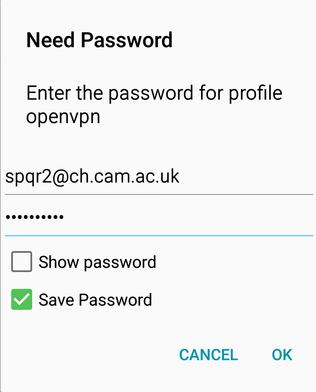 Enter your ChemNet Token into the Password field. The openvpn symbol and key should appear on the notification bar. Click on this link to find out. Then you might find our A-Z site index useful. Or, you can search the site using the box at the top of the page, or by clicking here.